The ‘Godfather of British Pop Art’ Sir Peter Blake celebrated his 80th birthday in 2012; the year was peppered with projects and events to celebrate the occasion. 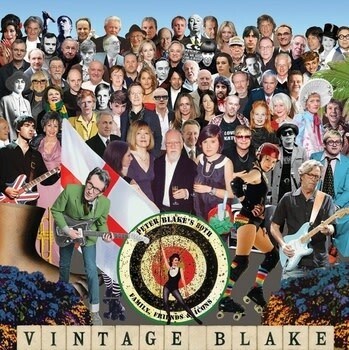 In Spring Blake unveiled a variation of his magic crowd compsosition: Vintage Blake: Peter Blake’s 80th Family Friends and Icons that was created especially for the celebrations around his birthday. The work features a magic crowd full of the key figures from the artist’s career and personal life, including David Hockney, Damien Hirst, David Bowie, Gary Oldman, Eric Clapton, Ian Dury and many more. A cheque for £10,000 -raised from pre-sales of Vintage Blake- has been presented to Kids Co. Sir Peter Blake's preferred charity.